all of his cds are great!!! my favorite is the live version of Damn! 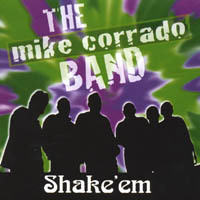 The CD Mike Corrado Band: Shake'em (live)is keeping me going as I exercise on my Bowflex Treadclimber. Thanks Mike and the band for giving me inspiration! The CD "Shake Em" by Mike Corrado band is great...we love every single song on the CD. Hope the band continues to write and perform their incredible music. We love this CD.